Nicky Holland is Bay’s resident fitness professional who aims to get us all into shape. This month Nicky has exercises that we can all do, but if you have any health issues you should always check with your doctor. When we are young, we are constantly being told ‘eat this, do that, it will make you big and strong. When we are young, we have lots of energy, we never get tired and we can eat anything and everything without putting on weight. Does this sound familiar? Yes…I can see you nodding. So at what age ‘are’ we big and strong? 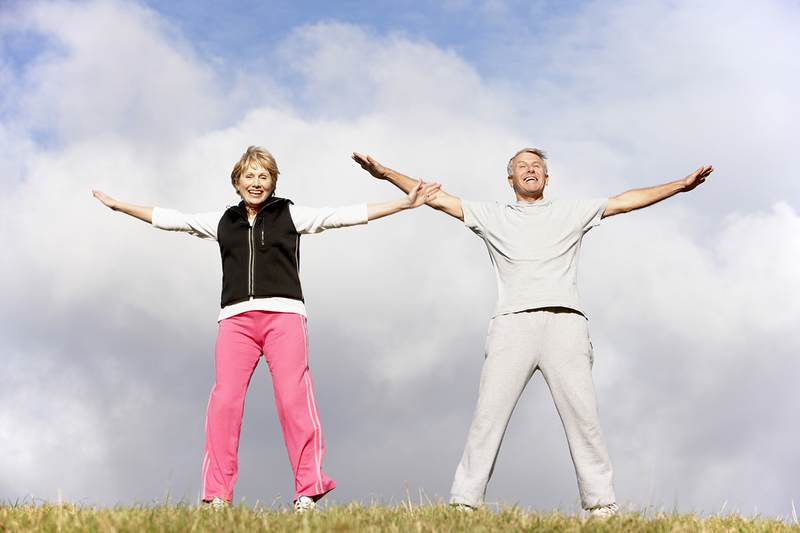 Many people tend to slow down as they get older, they stop exercising and doing the fun things that they used to. But it doesn’t have to be like this. You can get stronger with age, or at least try to maintain the strength or mobility you have. In this article, I will give you some tips that will help you to be active, maintain strength and mobility regardless of how old you are. Before we talk about strength, we will talk about flexibility. Are you ready? As we get older and less active, we spend more time sitting down. Over time, this causes our muscles and joints to stiffen up. Our basic ROM (Range of Movement) decreases and we lose flexibility. But doing some basic mobility exercises can help you. Here, I will target three areas. Shoulders – Arm circles. You can do this sitting or standing. Reach both arms out to the side and rotate in a circular motion. Aim to do x10 forward and x10 back. Rest and repeat x3 times. If this is too easy, you can add light weights or resistance (e.g. a bottle of water or bag of sugar) in each hand. Hips. Bend forward and backward. You need to stand up for this one. Place both hands on your hips and arch your back, forwards then backwards. Try not to hyperextend by going too far, just go to the point where you feel comfortable. Aim to do x5 forward and x5 backwards. Rest and repeat x3 times. Knees – Leg extensions. This can be done sitting down. Sit on the edge of your chair, one leg at a time, extend from a bent position to a straight position. You will feel this work your Quadriceps (thigh muscle). The slower, more controlled you go, the more you will feel it. Aim to do x10 on each leg. Rest and repeat x3 times. Linked with flexibility is stretching. I’ll be honest, I don’t stretch enough, but when I do I feel so much better. Stretching each part of the body will release any tension or knots in the muscle or the muscle fascia. If we exercise a lot, muscles become strong but tight. If we don’t exercise a lot, muscle become weak, therefore we need to stretch either way. Here’s a tip for you. When you wake up in the morning, sit on the edge of your bed or stand up and stretch. Reach as high up as you can with your arms, spread your legs and rotate side to side slowly. What you want to do is extend your arms, elongate your spine and encourage circulation, such as blood flow, which may be restricted as we have been lying down. I bet you will feel better and refreshed after doing it. Squats. But in the context of sitting down on a chair. Yes, I am encouraging you to sit, but this time, stand back up again. Try to do this 10 times. Rest and then repeat for 3 sets = 30 reps. When you do this, you are working the muscles in your legs. This is important to do, as it keeps the muscles strong. Wall push. This is essentially a push up but you are doing it standing up. Find a wall, stand 1 metre back. Extend your arms to reach and touch the wall. From there, bend your arms to bring your upper body closer to the wall. Then push back. Aim to do this 10 times. Rest and repeat 3 sets = 30 reps. I hope these exercises will help to improve your flexibility and mobility. The next article will be more strength based, but this is a good place to start. You have a month to try the above; then I will give you new ones to try next month.